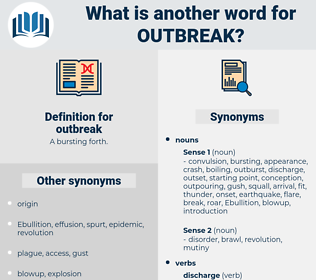 What is another word for outbreak? surge, surges, escalation, outset, incidence, hatch, elicitation, spike, epidemiological, epidemiologic, incident, collapse, detonation, pestilence, fragmentation, illness. 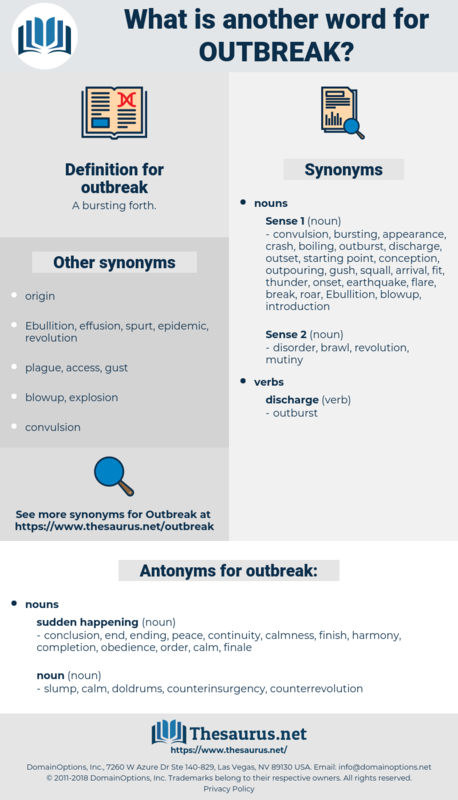 eruption, outburst, flare-up, infestation, burst, upsurge, explosion, bursting, epizootic, spate, outpouring, bout, break-up, erupting, epidemic, spurt, breakout, plague, apparition, conflagration, hatching, hotbed, breakdown, rash, boom, resurgence, rupture, breakup, recurrence, blowout, infection, blast, triggers, disintegration, advent, resumption, unleashing, breakthrough, wave, contagion, manifestation, crisis, cholera, onset. continuity, finish, conclusion, calmness, end, completion, ending, peace, harmony, finale, order, obedience. slump, calm, doldrums, counterinsurgency, counterrevolution. What outbreak of contempt might have come from the doctor's lips was fortunately lost at that moment, since a louder outcry than usual from outside, the screams of the children, and the wailings of the landlady, at length roused the mother to the length of going to the door. Twice the adjutant, sitting an absorbed and silent listener, thought the chief on the verge of an outbreak; but it never came. natural event, happening, Occurrent, occurrence.